By engaging in dialogic reading involving an engaging conversation about a text being read, teachers and families can maximize the educational benefits of reading to children. Questions about the text help facilitate dialogic reading. Translated versions included. Parents and teachers alike nearly universally accept the importance of reading to children. Even pediatricians and hospitals encourage it. However, reading aloud can have greater educational value than serving as a filler activity before bedtime or lunch. It is easy to simply take a book of a shelf, read it, and maybe ask a few questions at the end of the story without giving much thought to the selection of the book or the purpose of reading the story. Maybe it is the child’s favorite, or it is just the right length for the time allotted. Maybe it fits with the class theme of the week. However, these are all adult-directed examples. The adult selects the book, reads the story, and asks the questions or leads the discussion. A more engaging and productive alternative is interactive reading or dialogic reading. Dialogic reading involves an adult and child having a dialogue around the text they are reading. Their conversation includes defining new vocabulary, improving verbal fluency, introducing story components, and developing narrative skills. 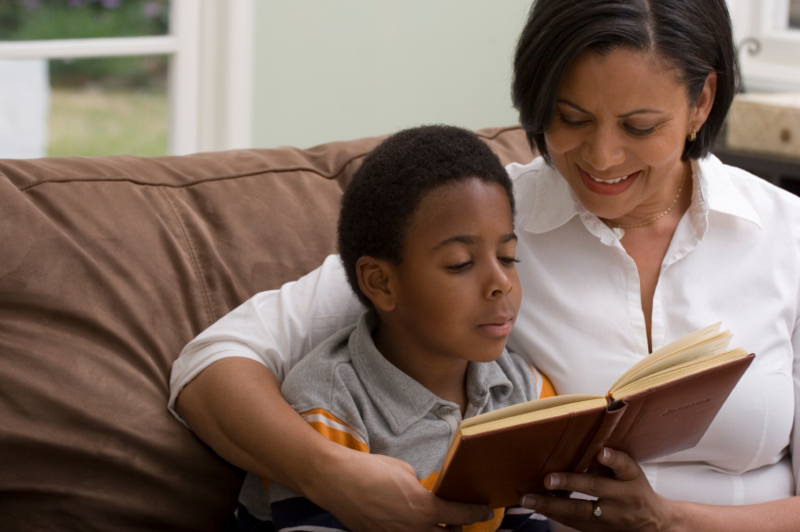 When parents and teachers properly plan and execute dialogic reading, research suggests it can be particularly effective at improving skills such as print awareness, oral language, and comprehension. Most importantly, it helps model how good readers think about the text as they are reading it. The benefits of dialogic reading are not just for young children. Although the concept originated with picture book reading for preschoolers (Whitehurst et al., 1988), a wide body of research has extended its use to other ages and populations including students with disabilities (What Works Clearinghouse, 2010), struggling readers (Swanson et al., 2011), and English language learners (Brannon & Dauksas, 2014). A traditional implementation of dialogic reading involves repeatedly reading the same book and interacting around three levels of questions (Flynn, 2011). Level 1 questions are basic “wh” type questions focused on what can immediately be seen (or read) in the text. Level 1 also includes introducing new vocabulary. For example, while pointing to a picture, the adult reader may ask, “What type of feet does this animal have?” Here the adult is looking for a specific, correct response to expand the child’s oral vocabulary. Level 2 questions are open-ended and are used to solicit the child’s feedback. For example, the adult reader might ask, “What is happening in this part of the story?” Here the adult is trying to encourage the child to share what he or she is thinking about and make meaning from the text. Is not "teacher reads, students listen"
Although several strategies exist to facilitate the three tiers of questions in dialogic reading, the two most popular are known by the acronyms CROWD and PEER. Both have been covered in previous IRRC blog posts, and this post will expand on the two strategies and provide another resource to help with planning a dialogic reading activity. CROWD is used to remember the types of questions to ask: completion, recall, open-ended, “wh” questions, and distancing. An extension of CROWD is CROWD-HS, which is used to encourage distancing prompts related to home and school. Here is an example of CROWD-HS questions for the well-known story of The Three Little Pigs. Answer: Blow your house down. Recall question: Which house couldn’t the Big Bad Wolf blow down? Answer: The one made of bricks. Open-ended question: Why do you think the first pig built his house out of straw? Answer: It was the easiest to build. He was lazy. “Wh” question: What kind of animal was after the pigs? Distancing: How do you think the pigs felt when the wolf tried to get them? Answer: (Answers will vary.) Scared, angry, sad. Home question: If you had to build a playhouse at home, what kind would you build? Answer: (Answers will vary.) Tree house, tent, fort. School question: The wolf was a bully. He was mean to the three little pigs. What should you do if someone is bullying you at school? Answer: (Answers will vary.) Tell a teacher. Tell them to stop. Ignore them. Prompt the child to say something about the book. Adult: What kind of animal was after the three little pigs? Adult: Yes, it was a big, bad wolf! Child: A big, bad wolf! Praise and Apply the child’s response. Adult: That’s right! The big bad wolf was after the three little pigs. Good job remembering the story! How would you feel if you saw a big bad wolf? Child: (Answers will vary.) I’d be scared and run away. Tier 1 words are basic vocabulary words that should be in the child’s receptive and expressive vocabularies. Tier 1 words in the story of The Three Little Pigs would include: house, pig, wolf. Tier 2 words occur with high frequency in texts for mature language users. These words should be taught to help expand the receptive and expressive vocabularies of the child. A Tier 2 word in the story of The Three Little Pigs might be eldest (some versions of the story characterize the first pig as the eldest of the three). Tier 3 words are domain specific and best learned when needed in a content area or in a specific context. These words are less likely to occur in a story like The Three Little Pigs. However, a more sophisticated version of the story might include the Tier 3 word for the bricklaying tool the third pig used: trowel. Although some words can be introduced during dialogic reading, it is important to carefully identify and pre-teach any words that might otherwise interfere with a student’s comprehension of the book. The adult reader can identify Tier 2 words that will be helpful for understanding the current text and that the child is likely to use or read in other settings. Now that we are swimming in levels, tiers, and alphabet soup, how do we keep our heads above water, bring it all together, and actually engage in dialogic reading? The most important thing is to adequately prepare! This includes selecting appropriate text that encourages dialogue, identifying vocabulary to pre-teach, thinking of CROWD-HS questions, and anticipating child responses with which you can use PEER+PA to expand the dialogue. The Interactive Reading Guide below can be put in every book to help you plan the vocabulary and questions you will include. The questions should be asked throughout the text, not just at the end, so do not forget to record a page number for each! This will make it easier for you or someone else to locate the targets for the conversation starters while implementing dialogic reading. Brannon, D., & Dauksas, L. (2014). The effectiveness of dialogic reading in increasing English language learning preschool children’s expressive language. International Research in Early Childhood Education, 5, 1-10. In order to provide this post and information about dialogic reading in the home to more families in Iowa, we have provided the following versions of the post and associated bookmarks and inserts, translated from English.